KATHMANDU, April 16: Pressure is piling on CPN (Maoist Center) Chairman Pushpa Kamal Dahal to put off the planned merger with the CPN-UML until the latter commits to equal and dignified status in the unified party. On Sunday, leaders affiliated to the Young Communist League (YCL), a youth wing of the CPN (Maoist Center), urged Dahal to be mindful of the party's core interests before inking a final deal on merger. Maoist leader Mani Thapa, who was present at the meeting, said that the youth leaders had asked Dahal to merge the party in equal terms and conditions. "Chairman (Dahal) assured us that both the parties would have equal status in the unified party," said Thapa. The youth leaders are the latest in a series of party leaders to meet Dahal with a call to resolve the outstanding differences before finalizing the merger. The UML and CPN (Maoist Center), partners in the ruling alliance which in February inked a seven-point framework merger deal, have already drafted political and ideological document for the merger. But the two parties are yet to give final shape to the documents due to differences over some key organizational and ideological issues. In particular, Maoist Center's demand for 50 percent share in the unified party has emerged as a major bone of contention and caused delays in the unification. The two parties also differ over election symbol and formal recognition of "people's war'" in the statute of the new party. UML has rejected all three demands. UML has proposed to give 30 percent share to the Maoist Center in the unified party but said that it could be revised. But the party appears reluctant to make explicit mention of the "people's war" in the statute. "Our party can accept the UML's election symbol but cannot give up "people's war". We are open to negotiation on the issue of the power-sharing. But the present gesture of the UML will not do any good," said a Maoist leader close to Dahal. Even as the self-imposed deadline for the proposed unification looms, the two parties have not been able to resolve disputed issues. 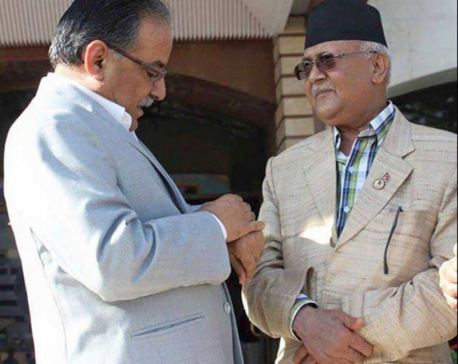 A meeting between Dahal and Prime Minister Oli planned for Sunday was cancelled after Dahal left for Sindhupalchowk. UML leaders said that Oli and Dahal are scheduled to meet on Monday. "The remaining issues will be discussed during a meeting," said an aide to Oli.